I was pretty jazzed that as an attendee of the conference I was able to get a sweet rate at the Hotel Breakers at Cedar Point, as well as some tickets to use for HalloWeekend. 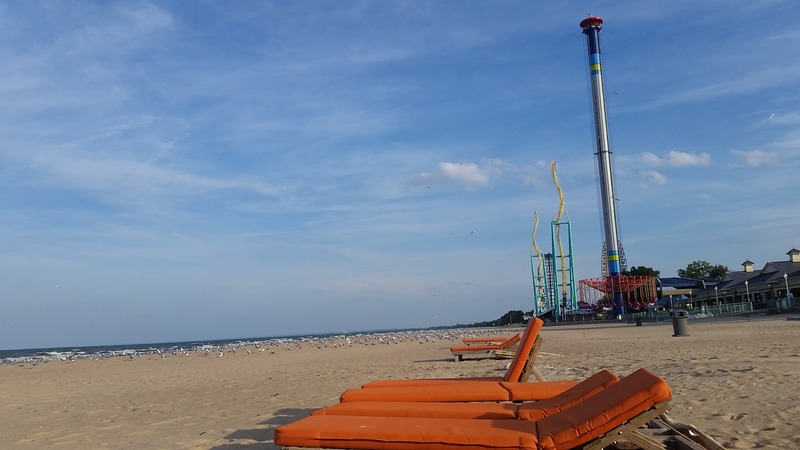 So off I went to Sandusky, ALL BY MYSELF, for a weekend of learning (and fun)! My initial sight of the hotel surprised me. Seriously?! Wow! The hotel was built in 1870, yet it had never made my radar as a travel-obsessed Ohioan. #thingshavechanged. The outside reminds you of a northeastern seaside escape. The parking was a breeze and the entrance to the hotel is pretty spectacular. The lighting was dimmed, I assume for their spooky, Halloween theme, so I didn’t get any good photos. The outside of the hotel is spotless. 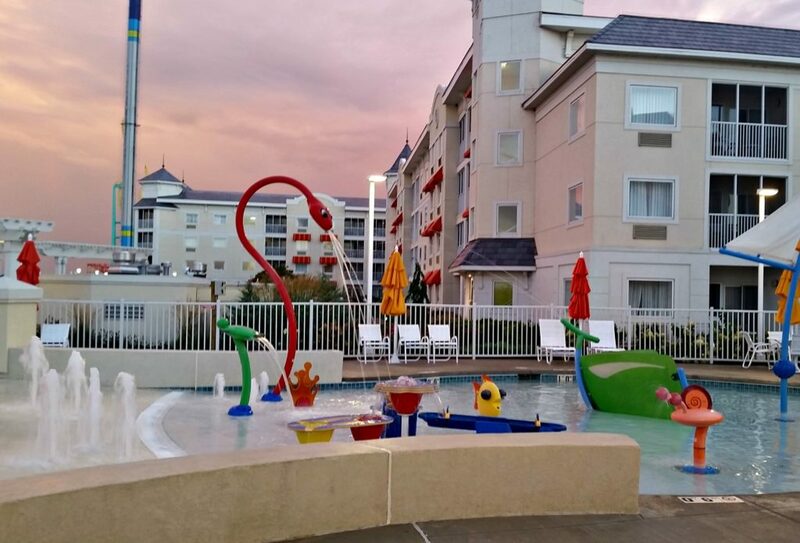 I loved the clean beach, the view of the parks, and the pool/kiddie pool area. Next year I’m definitely bringing the whole family. 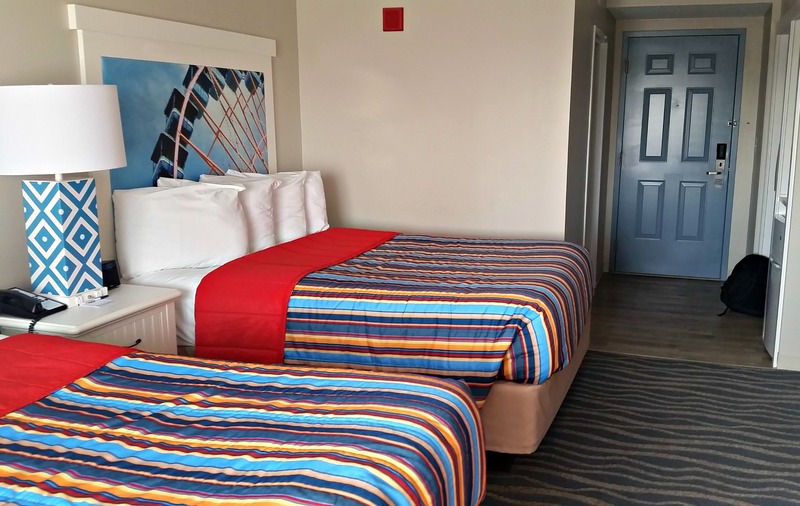 The hotel just went through a major overhaul in 2015. The rooms are fresh and clean! I had a 2 double bedded room with fantastic views of the park! At times though, the room felt a little noisy. I heard the screams of riders on the Top-Thrill dragster until close to midnight! However, I turned on the fan unit in my room and that helped drown out the noise. It was never so loud I couldn’t have slept. Conference friends that stayed in the king suites said that most of them faced towards the beach and have a screened-in porch! These rooms reminded me of beach vacations we’ve taken to the Southeast. I saw many families out on their screen-in patios playing cards and board games. How’s that for time well spent? I liked that there were 2 chairs at the desk- and there was a microwave and a fridge in my room! The bathroom was a little on the small side, but the vanity had plenty of room for make-up and hair accessories (Major A+ from this lady). Bath & Body Works toiletries were an exciting bonus! The view from my room- really spectacular! The resort’s location really can’t be beaten. It took me under 10 minutes to walk from my room to the park entrance next to the WindSeeker. 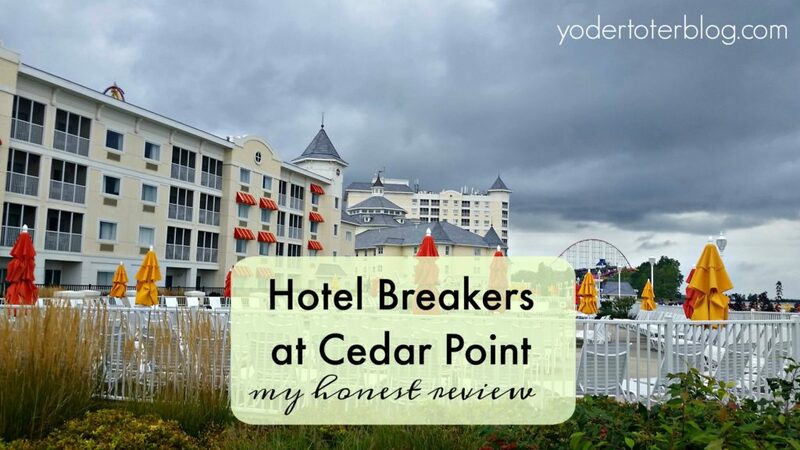 This would be the ideal place to stay for families visiting Cedar Point that have younger children or grandma & grandpa with you, as it’s easy to get a hand stamp and go back and forth from the park. The hotel has restaurants to suit every budget and lifestyle. There are a Perkins and a Japanese steakhouse just off of the Lobby. I dined twice at the T.G.I. Fridays because I was able to sit at the bar and be served right away. The weekend I visited was designated as a HalloWeekend. After 7 pm all of the creepy clowns, zombies, and ghosts make their appearance. The area by Frontierland is full of fog machines and it is difficult to see. You can purchase a “No Boo” necklace for $10 for younger ones who don’t want to be approached by one of the costumed workers. I think that you’ll have to know your kids— my 6 yr old would not be able to venture into Frontierland with or without the “No Boo” necklace. If you do have little ones, The Great Pumpkin Fest is currently taking place on Saturdays from 11am-7pm. The Planet Snoopy area includes Trick-or-Treat, crafts, and a pumpkin patch. I saw lots of small children with big smiles lining up with their bags of candy! 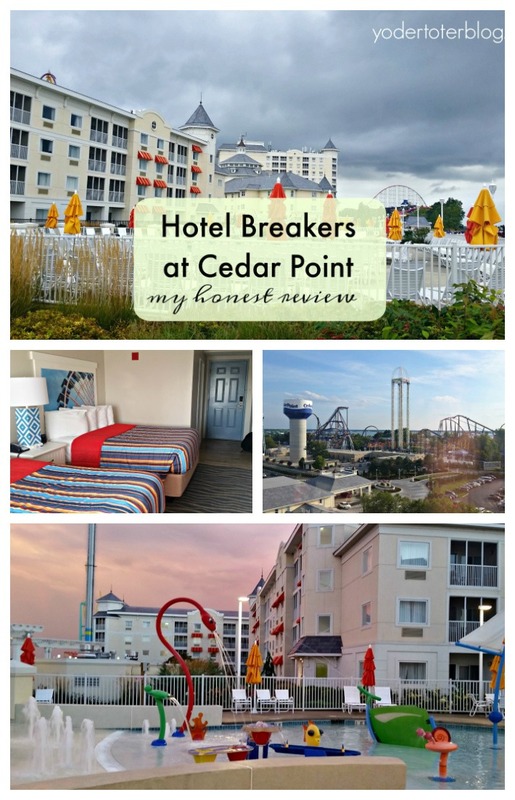 All in all, I had a fantastic weekend at the Hotel Breakers. I can’t wait to go back next year and take the entire family! 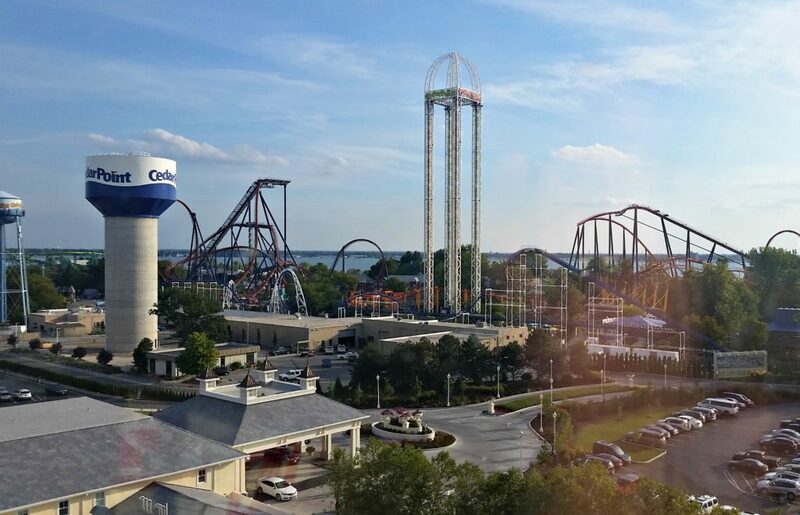 Have you stayed at any of the properties owned by Cedar Point? My parents just came back from a long weekend up there. They said the same thing about the coffee pot. 🙂 But they had a room with a screened-in porch, and they really liked that. Love this for a mini vacation for us. We may have to try this next summer or fall.